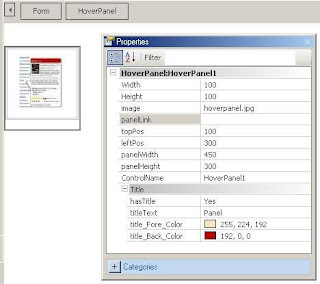 Fabian Bonilla sent me information on the Hover Panel GeneXus User Control he developed for GeneXus to solve the issue we were talking about in a previous post. The results are exemplified in the image to the left here and it's as easy as having a web panel and adding the Hover Panel control into a GX Form and setting some simple properties viewed in the image to the right here as well, such as the image name for the original image to expand, url of the object that will do the bubble expansion and title and positioning information. Fabian seems to have considered very well the next steps for his control which are to use relative positioning of the bubble, design improvements on the bubble and extend to other types of controls beyond images. On this same subject, Gabriel Medina sent me documentation on his GXWebResources KB, another approach to similar subjects including a bubble implementation very similar to the Hover Panel Control and Ajax Tabs that worked really cool. This KB will become very handy specially for 9.0 developments as Rocha might go more with the user control extensions. Anyway, I loved this little user control and its simplicity as well as the GX community response. Thank you Fabian for the control and the new link. Thanks Cecilia,.. I like the new Version GeneXus 10, I like the Web 2.0, In short, I will be launching my talent to User Controls for the GxX... . I promise you, I send my news, thank you very much for your very good FeedBack.